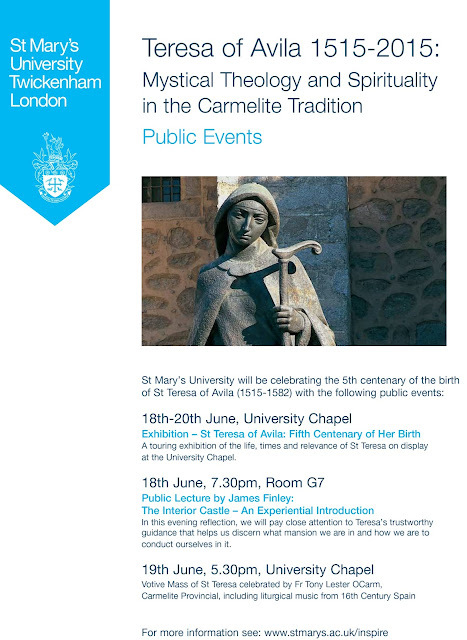 The first is the travelling Teresa of Avila exhibition which is touring the UK during this Teresian year. So far it has been to many British cathedrals and I think this may be its first visit to a British University. The second event is the public lecture by James Finley on the evening of 18th June. James was a novice of Thomas Merton and brings great experience and insight to Teresa's writings. Finally, we have our celebratory Votive Mass of St Teresa on the afternoon of the 19th June. The music will be drawn from that of 16th century Spain, especially the work of Teresa's fellow Avilan, Tomas Luis de Victoria. You are very welcome to all of these.